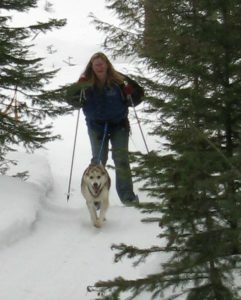 Learn about dogsledding, skijoring or dryland mushing. We will instruct beginners along with running our own dogs. No experience necessary and it’s FREE. Experienced mushers are always welcome to join in the fun (schedule below). Any type of wheeled rig (4-wheelers, dog scooters, bikes or carts) and your dogs are welcome. If you bring dogs, please have a tie-out system such as a picket line for them. Be prepared for any type of weather and bring mid-morning snacks and water for your dogs. Clinic Topics: dogs, training, equipment, nutrition and venues with lots of time to ask questions. REGISTRATION FORMS: Request forms or direct questions to adanac@adanacsleds.com or download form at www.montanamountainmushers.com. Call (406) 881-2909 or (406) 677-3141 for additional information. Registration deadline is September 28–please pre-register so we have enough 4-wheelers and instructors. Please e-mail the form to adanac@adanacsleds.com. SCHEDULE: Saturday, 8-11 a.m. run dogs; 11 a.m.-12:30 p.m. topic discussions; 1-3 p.m. Montana Mountain Mushers potluck (A-L bring salad, M-Z bring dessert) and fall meeting; 4 p.m. Kennel Tour; 6 p.m. BBQ at Rob Loveman’s kennel (bring meat & side dish), and Sunday, 8-10 a.m. run dogs. DIRECTIONS: Travel 4 miles north of Seeley Lake on Hwy. 83, turn left between mm 19 and 20 at White Tail Cabins onto Boy Scout Road, go 1 mile, turn right onto Fawn Creek Road, go three-quarters of a mile. Parking for West Side Bypass is on the left. Primitive camping is available. MOTELS: Seeley Lake Motor Lodge (677-2335) or Tamaracks Resort (677-2433). If you are bringing dogs, please ask whether they are dog friendly before you book your accommodations (they always have been). There is also primitive camping at the trailhead.